The January/February issue of SCUBA Diving Magazine was just released and covers the 2018 Readers Choice Awards. Not surprisingly, the Bahamas ranked on top for the reader’s pick, best big animals destination! 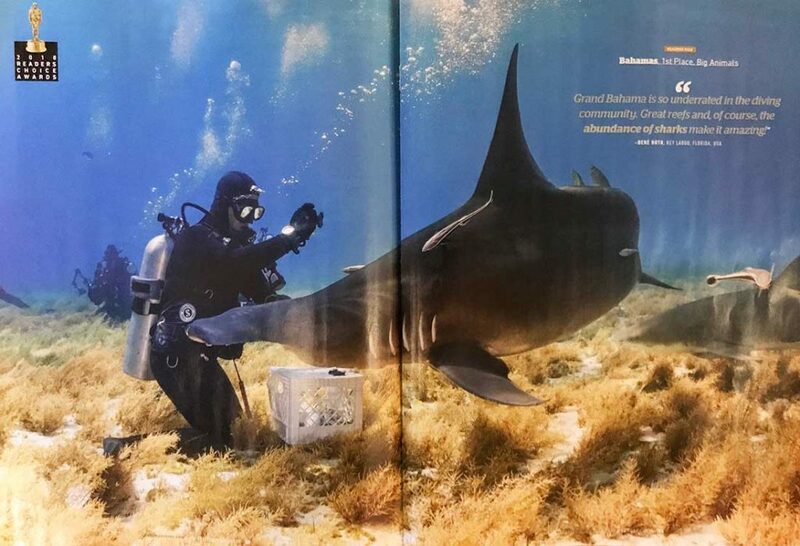 The 2-page photos used for the article was taken during one of our Tiger Beach expeditions this past February by Jennifer Penner of NewMediaSoup. Great Hammmerheads - Bimini plays host to endangered Sphyrna mokarran. Once the hammers show up, you'll drop down on a shallow-water sand beach in blue water, perfect for wide-angle photography. Bull sharks often crash the party. Tiger Beach Excursion - Sixteen-foot tigers are the main attraction at this shallow water site off Grand Bahama's West End, but you've also got a good chance of encountering lemons and Caribbean reefs. 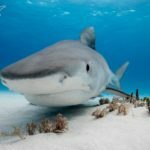 Cat Island Sharks - Open-ocean advanced diving is available in the central Bahamas with oceanic whitetips, plus dusky, lemon, tiger, and silky sharks - and possible encounters with Atlantic blue marlin, which can measure 16 feet long and weigh up to 1,800 pounds. 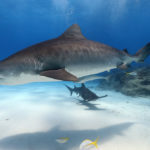 Tiger Beach is undoubtedly one of the world’s best shark diving sites and each year seems to get better and better. In the recent few seasons, we have been having reliable encounters with Great Hammerheads during the January – April timeframe. 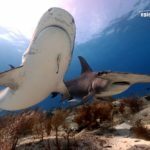 It’s an amazing experience to have Tiger Sharks, Reef Sharks, Lemon Sharks and now Great Hammerheads and Bull Sharks all together on the same dive. Contact us for more details and to make a reservation. Hi, We are staying at Paradise Cove beach resort till 28/12. Any chance you have one spot open on the Tiger beach dive any of those dates? Thanks. Hi Anand…we sent you an email!